Click here for a complete list of Educational events! Perpetual Education trophy awarded to the High Point Open, Amateur, and Youth for riders who attend or present a qualifying educational event. Save your tests! The CAWDA 2019 Statewide High Point Competition is on! 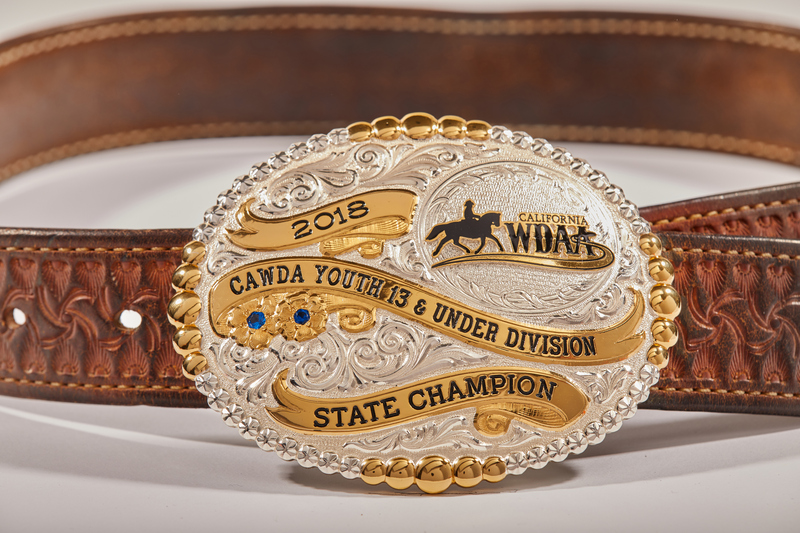 The CAWDA is offering 2019 Statewide High Point Awards for Open, Amateur (18 & over) and Youth (13 & under, 14-17) Rider/Horse combination and awards for all levels as well. The High Point Award program is open to all CAWDA members in good standing. Here’s what you do: Ride at qualifying Western Dressage shows, save your written test from the judge, and send us a copy of the face sheet of the test with the score, the date and location of the ride, and the judge’s signature. Your percentage score will be used as your point score for that ride (for example, if you receive a 65.5%, you receive 65.5 points). Submit as many tests as you want (five minimum) from three or more CAWDA approved shows. Points for your highest five scores will be counted and totaled. The rider/horse combination with the highest totaled score will be awarded the high point. (See below for complete rules. 1. One horse/one rider combination: Riders may compete with multiple horses, but each horse/rider combination accumulates points separately. 2. Division Awards in: Open, Amateur 18 & over, Youth 14-17, Youth 13 & Under. 3. Youth age will be considered as the rider’s age on January 1, 2019, and will be considered that age throughout the show year. 4. Overall high point awarded in each division and Level and Freestyle awards by level/division designation. Any 1st place level award with less than 3 riders may receive a lesser award at the discretion of the CAWDA Board. 5. Horse/rider combination may only compete in one division. Riders changing divisions during the High Point year will forfeit any points accumulated up to the time of division change. Open division riders are typically professional horse trainers. 6. CAWDA High Point competition is open to all participants who are both WDAA and CAWDA members in good standing, except those judging a 2019 CAWDA approved high point show or the designated CAWDA Points Keeper. 7. Points can be submitted in Introductory*, Basic, Level 1, Level 2, Level 3, Level 4 and Freestyle. No other specialty classes, such as WD Equitation, WD Suitability, WD Hack, will be counted. *Introductory class points will only be applied toward Open and Amateur Introductory Level awards; Introductory points will not count toward Open or Amateur Division awards. Youth Introductory scores will be applied for both the Division and Introductory Level awards. 8. All freestyle levels will be considered as one class per division (Open, Amateur, Youth 13-under, Youth 14-17) for the High Point Freestyle awards. 9. Freestyle scores are not counted toward the Division awards. 11. Horse/Rider combination must submit at least five scores from qualifying shows to qualify for Division awards. Horse/Rider scores qualify for Level and Freestyle awards when Division qualifications are met. 12. Horse/Rider combination can qualify for Level awards in a maximum of two consecutive Levels (for example, Introductory and Basic, Level 1 and Level 2, but not Basic and Level 2). In the event that a horse/rider combination submits scores in more than two levels, rider will be asked (via e-mail) to declare for which levels they are qualifying, and that declaration will remain in effect through the remainder of the show year. Scores for Levels not declared will be discarded. This rule applies to Freestyle tests as well. 13. No more than two scores in each level will be accepted from one show per day. If more than two are submitted, the lowest scores will be discarded. 14. Scores will only be accepted for all breed (non-breed restricted) classes. In the event a show has both breed-restricted and non-restricted classes, only classes that are non-breed restricted will be accepted. You do not need to submit the part of the test score sheet containing comments or individual movement scores. 16. Scores must be submitted to the CAWDA no later than 30 days after the date of the qualifying show in order to be counted (i.e, the due date). Rider must be a current CAWDA and WDAA member at the time of submission of score sheet. If rider is not, he/she must join CAWDA (and WDAA if they are not a current WDAA member) before the submitted show's high point due date. 17. Corrections to Test Scores – It is the rider’s responsibility to ensure that the test was correctly summed. In the event that a test was summed incorrectly, the rider should contact the show secretary or show manager at the show and request an initialed change and sign off. If a rider identifies an error in summing after the show is over but within 30 days of the show, the rider should contact the show manager or secretary and request an initialed change. The show manager or secretary must also send an email to info@cawda.org indicating their approval of the change. Any changes to scores more than 30 days after the show will not be accepted by CAWDA. 18. Professional riders: the owner of the horse being shown must be a current member in good standing of both the CAWDA and WDAA at the time of point submission. If owner is not, he/she must join CAWDA (and WDAA if they are not a current WDAA member) before submitted show's high point due date. 19. Top five percentage scores will be added to calculate total points in Division, Level and Freestyle awards; lower scores will be discarded. Open and Amateur Intro scores will not be counted for Division awards. 20. Level high points will be calculated in the same manner as Division high point. Points are accumulated for each level (maximum two contiguous levels) in which horse/rider entered. 21. In case of a tie, the horse/rider with the highest single score is the winner; if the highest scores are the same, the next highest scores will be considered until the tie is broken. Open and Amateur Introductory scores will not be considered in the case of a Division tie. 22. Total point accumulation will be posted on the CAWDA website weekly. 23. It is the rider’s responsibility to ensure his/her points are correctly recorded on the website. Questions regarding point calculations should be sent to info@cawda.org. 24. Year-end awards will be given as follows for Divisions: Champion: award and ribbon; Reserve Champion: award and ribbon; Places 3-10: ribbon only. Year-end awards will be given as follows for Levels: Champion: award and ribbon; Reserve Champion: ribbon only; Places 3-10: ribbon only. 25. CAWDA fees: Approved CAWDA high point shows charge $3 per Western Dressage entry. The CAWDA has no per class qualifying fees. 26. The 2019 CAWDA show year runs January 1 to November 2, 2019. No shows scheduled between November 3 and December 31, 2019, will be approved as a 2019 CAWDA High Point show. Approved 2019 shows postponed due to unforeseen circumstances which are rescheduled after November 2, 2019, will count toward the 2019 CAWDA High Point. 27. Show management has the right to cancel a CAWDA qualifying show at its discretion. CAWDA has no authority to compel show management to hold a scheduled show or reschedule a show, or set any policies or rules governing the show. 28. The CAWDA reserves the right to change these rules at any time at its discretion. Are you competing on your favorite Arabian, Quarter Horse, mule, Appaloosa or other equine breed? Show your support for your best horse by sponsoring a CAWDA Breed Recognition award. CAWDA is offering an award to the highest scoring horse nominated by its registered breed in conjunction with the CAWDA High Point program. This is a sponsored award; only sponsored breeds will be eligible. Sponsorships are $100 per breed. Any breed may be sponsored including a “Unknown Breed/Unregistered Breed” horse. Sponsors will be listed in our eNews monthly for a full year and on our website and will be recognized at our year end awards banquet. To sponsor a breed award, send your check and the breed you wish to sponsor to CAWDA, PO Box 44, Sunland, CA 91041. 2) Click the button below to complete the Breed Nomination form. NOTE: We must have your nomination on file in order to be considered for a breed award. The Horse within its breed category with the highest points will win the Breed Award.Highest points will be calculated by the Horse’s top five scores submitted and totaled. Intro and Freestyle scores to count regardless of rider’s status (i.e, Open, Amateur, Youth). Horse may be ridden by more than one rider; top five scores will be selected from all riders’ scores combined. No equitation, suitability, hack or other “flat” classes to count. In case of a tie, highest single score submitted will determine the winner. Refer to the CAWDA Statewide High Point rules for eligibility and any circumstances not documented here. In keeping with our educational charter and focus, the CAWDA Board will offer a special perpetual Education trophy for professional, amateur and youth members. 3) and have participated in at least one Western Dressage educational event between November 1, 2018 and November 15, 2019. The event must be approved by the CAWDA Board, but may be submitted before or after the event. All submissions must be submitted and approved no later than November 15, 2019. Youth and Amateur members may attend a Western Dressage educational event, such as a clinic, seminar, Train The Trainers™ program, or a judges’ seminar as a participant. Auditing may be accepted provided the attendee can show proof of attending the event. Participation and auditing will be subject to verification with the event organizer. 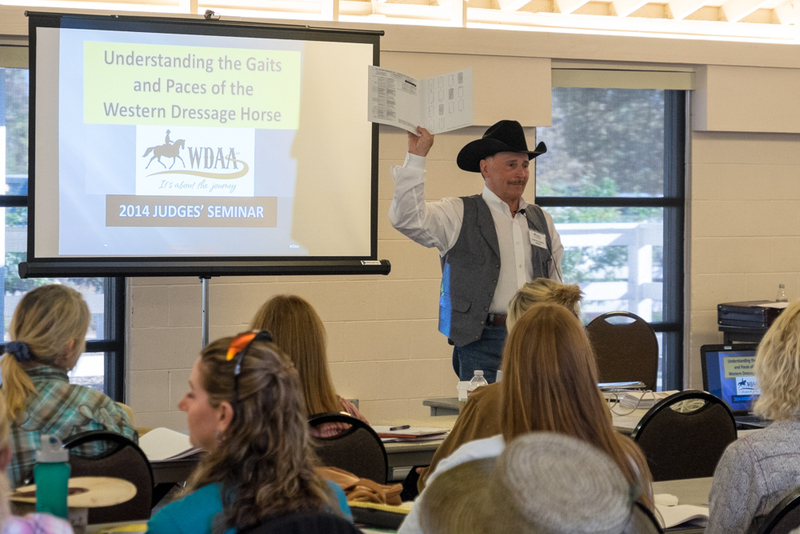 Professional members may attend a Western Dressage educational event (as described above), or may teach or present a Western Dressage educational event such as a clinic or seminar. Teaching riding lessons or training (outside of a clinic or seminar) does not count for professional qualification. Mentor activities will also count toward the qualifying educational event. The qualifying educational event must occur between November 1, 2018 and November 15, 2019. Enter your qualifying event by clicking the link below and upload a scanned receipt, ticket, event flyer or other proof of attendance. For questions about the award, ask us at info@cawda.org. Note for trophy seekers – the CAWDA will retain the Perpetual trophy to be displayed at CAWDA events whenever possible. An engraved nameplate will be put on the perpetual trophy with the winning rider's name. Winners will receive a plaque or similar trophy (to keep forever) and a picture of themselves and the Perpetual trophies, which will be taken at the CAWDA year-end banquets. Click here to register for this Year's Education Award. Click here for a complete list of 2019 CAWDA Statewide High Point Approved Shows. What is a CAWDA Mentor? The CAWDA Educational Mentor Program recognizes that its members are the program’s best spokespersons. The Mentor Program is open to Western Dressage enthusiasts, both trainers and amateur riders who can use their enthusiasm and knowledge to project a clear and accurate image of Western Dressage in demonstrations and events, and promote the vision and mission of the Western Dressage Association of America by building relationships with their local horse clubs and other venues interested in Western Dressage. The program was piloted at the California State Fair and UC Davis Horse Day with much success. •	have attended the WDAA Train the Trainers™ program or have participated in at least two Exhibitions conducted by a CAWDA Mentor. Mentors identify potential educational venues and coordinate each event, including choosing demo riders, scripting dialog, organizing practice sessions, and are responsible for the overall management of the event. Who are the CAWDA Mentors? Click here for a list of current CAWDA Mentors. Click here for more information about our CAWDA Mentors program.